It’s been so exciting to try out a recipe from the Vegetarian Viet Nam cookbook by chef Cameron Stauch. I have a deep appreciation for Vietnamese food. I think I went through a faze in university where I actually lived off of vegetable pho soup form this adorable little Vietnam’s restaurant. I’ve tried to recreate my own vegan version the last few years but I have not been able to really gain that authentic taste. This book was my saving grace when it came to understanding and creating delicious vegan Vietnamese disHes! I loved the way Cameron really shows how to prepare Vietnamese staples. And I was able to easily find a lot of the recipes ingredients at my local grocery market! Seeing as it’s finally warming up here in Montreal I decided not to make the Vietnamese pho soup, I was deciding on one of his colour salads. Specifically the “Twelve Predestined Affinity” Salad… yes that’s the name. Cameron goes on to explain the English translations to Vietnamese dishes can be a bit strange. But the beauty in the odd translations led him to discover this dish at a restaurant in Huet. And recreating his version of the recipe. 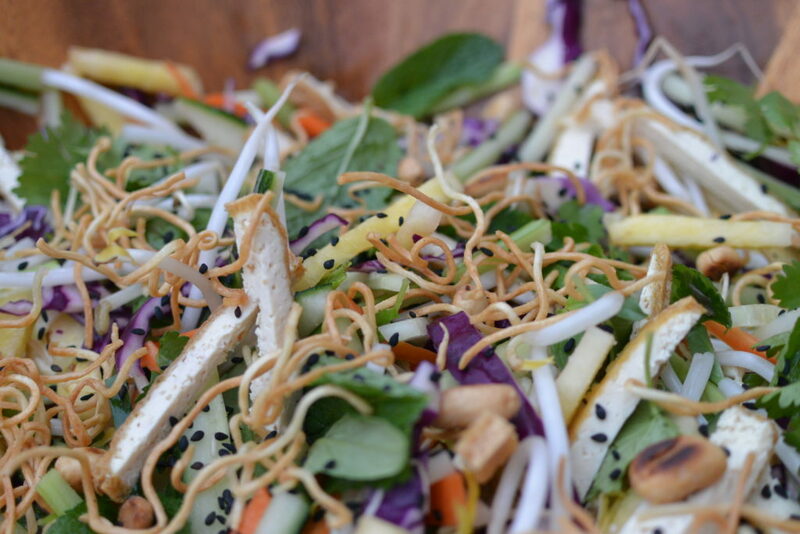 I am so glad that he did this recipe because the mix of flavour and texture in this salad is incredible! 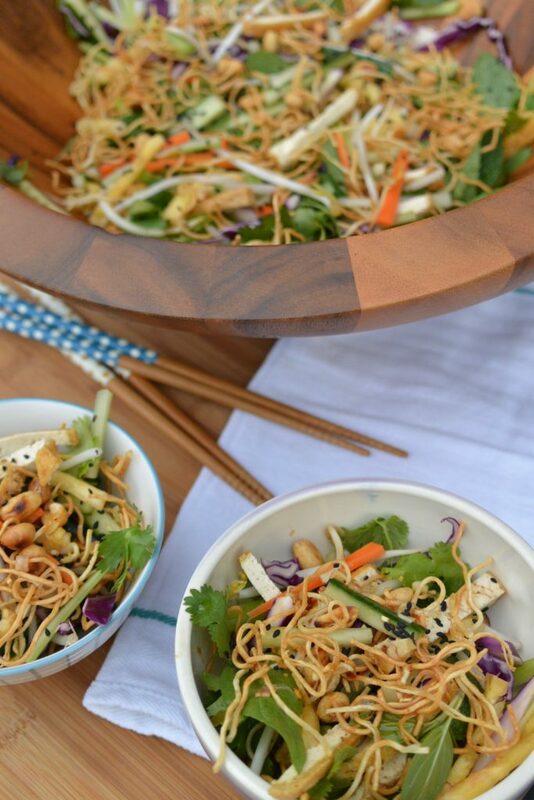 The crunch from the crispy chow menu noodles and the sweetness from the pineapple really tie together the wonderful flavours of this yummy colourful and fresh ingredients salad. Cameron easily gives options to swap out vegetables that might be a bit harder to find like instead of jicama you can use broccoli stems. The clear instructions in the book can easily be understood by any novice cook. I decided to make the crispy chow menu noodles and the fried tofu with my air fryer. Instead of frying them with a lot of oil. And I made them a few hours ahead. So all I had to do was chop up the veggies into match stick pieces. I also did not add the fresh mild chilli in the dressing. I could only find chilli peppers that were spicy. I’ve been avoiding spicy food since I’ve started getting bad acid reflux now that I’m nearing the end of my pregnancy. Cut tofu into long thin strips once it has been fried or air fryed. Break the crispy noodle soup into small pieces. Before chopping all the vegetables make dressing and set aside to allow the flavours to marinate. Spoon In Lime juice, soy sauce and sugar in a small bowl stir sauce until sugar is dissolved. Right before serving sprinkle herbs and pour dressing over the top. Toss to mix well. 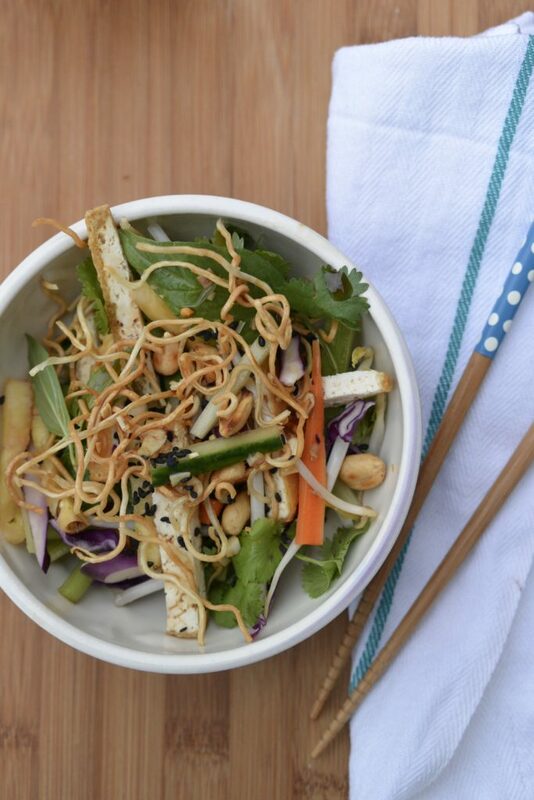 Garnish with toasted seasome seeds, peanuts and chow meng noodles. Serve immediately. That looks great. I’ve not tried Vietnamese food before either. Sounds like a great recipe and a great cookbook! The salad dish looks just perfect for this season and what an amazing name! Cameron Stauch’s book sounds really useful. I love vietnamese food but don’t find it easy to re-create the authentic flavours at home. I have been looking for a good NAM recipe forever. Thanks! I cannot wait to try this one out. This looks amazing!! Thanks for sharing your recipe! 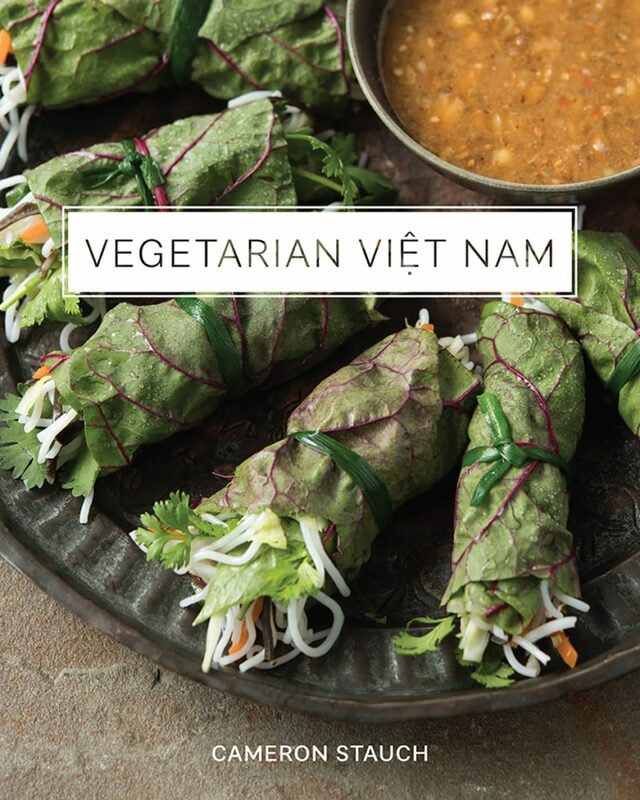 Ooh that looks totally delicious – I love Vietnamese food and so much is vegan-friendly. Will look out for that book, right up my street! 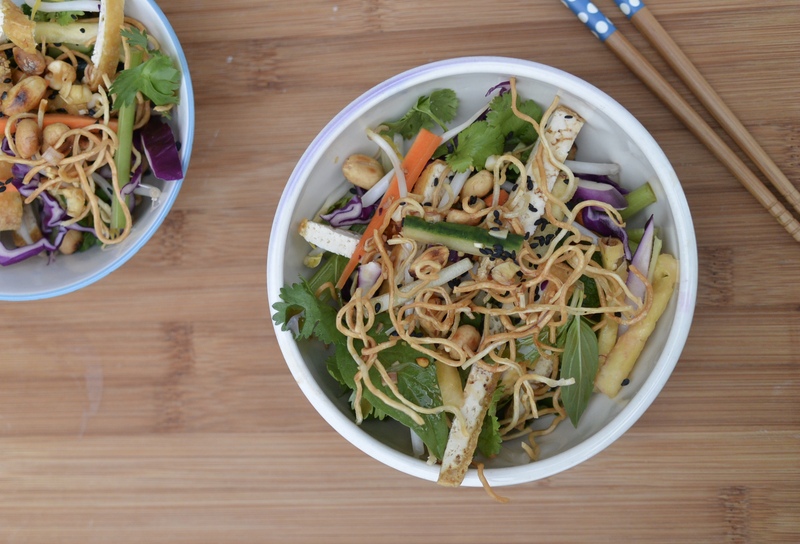 I have never made a Vietnamese dish before but this looks so tasty I will have to try it! I would have thought that vegan recipes tend to be a little less flavorful due to limited ingredients, but I can see from this post that I am so wrong. The photos are stunning! This looks great, love that it’s vegetarian!